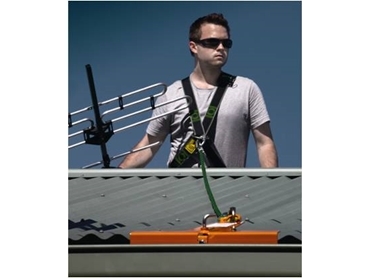 New Roof Worker height safety kits from Honeywell Safety Products Australia (previously Sperian Protection ) will keep workers as safe as the houses they are working on. With three different types of Roof Working height safety kits available, each containing a harness, webbing tie-off, and an anchorage line with a type-1 fall arrestor, all provided in a handy carry bag or backpack, workers on all types of roofing jobs are protected. When appropriate control measures are not in place, workers who install roofs or work on roof framing are exposed to falls which can result in serious injuries, which significantly affect a worker’s chances of returning to work. To minimise the risks, suitable fall protection should be worn when working from any height over 2m. Adequate fall protection equipment includes a harness and a proper fall arrestor, lanyard or anchorage line, as found in the HoneyWell Roof Worker height safety kit, designed specifically for working on roofs. Harnesses in these height safety kits include attachment points at the front and rear of the harness, allowing flexibility when selecting a suitable anchorage point. When installing anchorage lines it is important to pre determine the anchorage points before commencing work as they allow connection to an anchorage point on the opposite side of the roof to which the person is working. If an anchorage point is not readily available there are temporary points, designed specifically for domestic or commercial roofs, which can be installed. Webbing tie offs can also be used as to create an anchorage point by wrapping the webbing tie off around an overhead beam, for example, and then attaching either a lanyard or fall arrestor as needed.